A few weeks ago, I participated in the English Companion Ning‘s Webstitute “Work with Me”. (By the way, if you teach English and are not yet a member of the Ning, get yourself over there ASAP and sign up. It is free and full of ideas, networking, and just plain fun.) The best session in the webstitute, for me, was Penny Kittle’s “Craft Analysis”. This year, I have been struggling to get my freshman to take risks in their writing. I teach at a math, science, and technology magnet-like school and all of my students are brilliant. However, many of them are very analytical and black-and-white when it comes to writing. They tend to write a lot of plot summary and avoid any type of analysis. I figured out that they were afraid of being wrong and losing points, but nothing I tried was working- they were still regurgitating plot and not analyzing and thinking on their own. Lately, I have also been reading a lot about our students’ deficits with close, deeper reading. (Too Dumb for Complex Texts?) Colleges have been lamenting that students are unable to read complex texts and end up in remedial courses. I want to make sure that my tech-driven students are readers who are ready for the rigors of the rest of high school and college. I have spent weeks (maybe even months!) brainstorming ways to bring this to the forefront in my classroom, too. Then I participated in Penny’s portion of the webstitute. She shared a craft analysis project that she did with her students and I was immediately inspired. It was exactly what I had been trying to come up with, but had been unable to pull together in any type of organized manner. Penny was kind enough to share her handouts and I immediately downloaded them. Over the past few weeks I have been working on tweaking the project for my particular students while also working through the project myself, in order to model it for them. I am rereading Judy Blundell’s National Book Award winner, What I Saw And How I Lied. I’ve storyboarded about half the book while also writing my thoughts, noticings, and questions. It’s really made me work hard and notice Blundell’s craft moves, things that didn’t jump put at me on my first-draft reading. I was so excited to share this with my students and see what they came up. This past week, we started the project. Right now, each student should be working on storyboarding the book(s) they chose to reread. I had each student respond to an assignment on Edmodo telling me what book they would be analyzing. They picked some great ones! Examples include The Book Thief, The Shadow Children series, Between Shades of Grey, The Knife of Never Letting Go, The Thief, Impulse, Paper Towns, The Hunger Games, And Then There Were None, Ender’s Game, Twelfth Night, Of Mice and Men, The Outsiders, Thirteen Reasons Why, North of Beautiful, and so many more great books! Next week, I will have them working on the project in-class one day, sharing their craft noticings with other readers and comparing their books. I am dying to know what they are coming up with and I can’t wait to see their storyboard notebooks. I will be sure to share their progress here! By the first week in March, each student will produce for me a 2-page paper analyzing the author’s craft and sharing their analysis with me. Absolutely no plot summary is allowed! They will use their text notes/storyboarding to draft the paper, along with any notes they take from their peer discussions. They will share drafts with each other on Google Docs/typewith.me, assisting one another. Spending the next four weeks doing this will hopefully help them to become better risk-takers in their writing. I am so looking forward to the results! On Sunday afternoon I sat down and started to sketch the upcoming weeks for my freshman class. After having 10 days off, it was difficult to figure out what I wanted to do and where I wanted to go before midterms. Plus, I knew that it would take a day or so to get back into the swing of things (for the kids! And maybe for me). I started tweeting about my dilemma and then checked out the English Companion Ning. I was inspired when I found Jo Hawke’s blog post about Words of Intent. The more I read about it, the more I wanted to do it. In the past I have done One Little Word with my middle schoolers, but I wanted to make it a bit more reflective for my advanced 9th graders. On Monday I ended up having a double period with both of my classes and we spent about 25 minutes on our Words of Intent. I started by having my kids do a quickwrite on New Year’s Resolutions. I asked them to write whatever came to mind when they heard the phrase “New Year’s Resolutions” and then we shared some of our thoughts. After discussing why we thought that people tended to “quit” on their resolutions, I introduced the idea of intentions. After a bit more discussion, I projected a list of intention words on the document camera and asked the students to reflect on the words that stood out them on a personal level. After they chose their word, they took an index card and wrote the word on the front. I allowed them to write their name on the front or back, depending on their comfort level. They also got to decorate the front of the card. Om the back, I asked them to write 2-3 sentences explaining what the Word of Intent meant to them and what they hoped to accomplish in 2011. It went really well! Even the students who joked around while filling out the card ended up writing serious words of intent and explanations. After class ended, I hung all the words on my closet door, forming a “Wall of Intent”. I plan to keep them there all year, but give them back in June. As I told me students, we will be halfway through 2011 when school ends, so that will be the perfect time to reflect on how we are doing. The latest issue of Choice Literacy has a great article about schoolwide literacy activities that is a must-read. My personal favorite is the story of the middle school where students broadcast their current reads on their lockers. I’ve spent a lot of time today trying to figure a simple way to do something similar with my own students. I love the idea, but I know it would be very difficult to keep up with the covers that would need to be printed for the idea described in the article. I’ve come up with a few ideas and will be experimenting tomorrow. The idea I think will work best is laminating a sign for each student that will read “I am reading _____________” and they will fill in the title of their current book. Most of my students have whiteboard inside their lockers so we will try to use Expo markers. Needless to say, I will be playing around with the idea a lot tomorrow. In the event this doesn’t work, does anyone else have any suggestions? We have tall lockers that line both sides of the hallway. Due to privacy/theft concerns, I am hesitant to have students place their names on the signs. Also, we have a serious lack of printers (especially color printers!) so printing the book covers probably isn’t an option. Any ideas? Last week I decided to add a new assignment to my “Getting to Know Ourselves as Readers” unit in reading workshop. I paged through a few of my resources looking for inspiration. While flipping through Beyond Leveled Books, Second Edition I came across the family reading interview. I took the idea and ran with it! I adjusted the questions to fit my students/grade level and was very happy with the results. Students were required to interview one member of their family (high school senior or older) about their reading experiences. They asked about the genres they enjoyed, genres they don’t enjoy, how they choose books, and favorite childhood reads. The students were then required to put all the answers into paragraph form, with their own commentary, forming an essay. I was looking forward to reading some interesting interviews when I collected them today. Students also enjoyed learning about their parents’ favorite books. Especially their childhood favorites. I saw everything from Flowers in the Attic and Forever to The Velveteen Rabbit and Peter Rabbit. Quite a collection! I am so thrilled with the connections that occurred while my students held the interviews with their family members. I learned so much about their families and they learned so much about the person/people they interviewed. I would highly recommend doing a family reading interview in your class! It can definitely be adapted for any grade level! 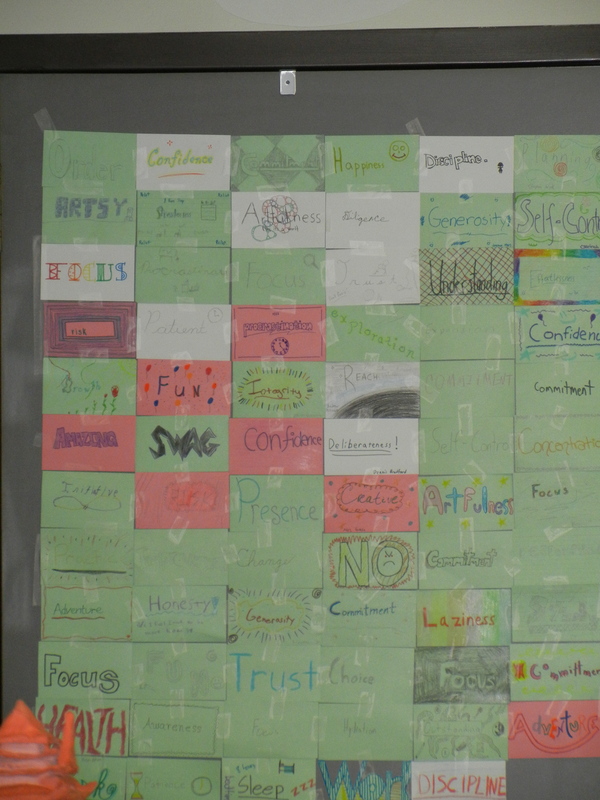 As a way to build community this year I decided to do an activity using I Can’t Keep My Own Secrets: Six-Word Memoirs by Teens Famous & Obscure. This week each student will be coming up with their own six-word memoir which we will then hang on the bulletin board for Back to School Night. The memoirs will be anonymous but I think the parents will really enjoy them. I know I hope to get to know my 100 students a bit better through this activity. If you are interested, below you will find the handout I created for this activity. As one of the final activities on our final day of school, I had my students fill out “Recommend a Book” postcards for next year’s 6th graders. I reminded them that on the first day of school they thought I was out of mind when I said they would read between 20-40 books over the course of the year and that they would enjoy it. We talked about how they discovered the joys of reading books they liked, recommending books to each other, and learning about new books from their classmates. Cirque du Freak: A Living Nightmare by Darren Shan because it is one of the best series ever. This book has spine-crunching twists and turns, a touch of action, and thrills. The Hunger Games by Suzanne Collins because it is action-packed and keeps you at the edge of your seat. Fire Within by Chris D’lacey because it has action, adventure, mystery, and fantasy. The Lightning Thief (Percy Jackson and the Olympians, Book 1) by Rick Riordan because this books is really cool. It is interesting and makes you love mythology! Twilight by Stephenie Meyer because it was the first book I read this year and after I read it I couldn’t stop reading! Flying Solo by Ralph Fletcher because it’s a really funny book and you can relate to it. A Mango-Shaped Space by Wendy Mass because it has such a great story and will change the way you look at the world. Tuck Everlasting by Natalie Babbitt because it’s a good book. If you love mysteries you should read this! Evermore (The Immortals) by Alyson Noel because it is an awesome romance. I give it 9 out of 10 stars. Windcatcher by Avi because it is a great book. It has hidden treasure and a mystery. The Diamonds by Ted Michael because it is a great book for all girls! It is a page-turner and full of gossip! An amazing book! Diary of a Wimpy Kid by Jeff Kinney because it is really funny and makes me and other kids laugh out loud. Oh. My. Gods. by Tera Lynn Childs. If you like Greek mythology, you’ll love this book! It has romance, comedy, and mythology. It’s a keeper! Skeleton Creek by Patrick Carman. If you like creepy, this is beyond creepy. It is suspenseful and there are videos in-between. You watch the videos after reading a few pages. Secrets of My Hollywood Life by Jen Calonita because this series tells you what it’s like to be a part of Hollywood. The books make you feel like you are in it! Gone by Michael Grant. It’s a good cliffhanger book. If you like the dystopian genre it’s really good. The atmosphere makes you feel like you are right there in the book. The Clique by Lisi Harrison because it is full of drama! Flush by Carl Hiaasen because it is a great book and very interesting. Harry Potter and the Deathly Hallows (Book 7) by J.K. Rowling. You should read this books because it’s action-packed and a great read! Life As We Knew It by Susan Beth Pfeffer. I think you should read this books because you feel like you’re there and it is very suspenseful I like books like that. I hope you do, too. In the Serpent’s Coils (Hallowmere) by Tiffany Trent. It’s scary and it’s unexpected at times. It always makes you want to read more. Found (The Missing, Book 1) by Margaret Peterson Haddix because it is suspenseful and ends on a great cliffhanger. The Angel Experiment (Maximum Ride, Book 1) by James Patterson. It was my favorite book this year and the entire series is great! Akiko on the Planet Smoo by Mark Crilly because it is a very funny book! The Secret Language of Girls by Frances O’Roark Dowell. This book is good. There is a lot of drama and it is about two best friends going through hard times in middle school. I,Q by Roland Smith. It’s full of action and adventure. Boy Who Dared by Susan Campbell Bartoletti. This book was a really good Holocaust book. It is about a boy who was a Nazi then he betrayed the Nazis and ends up in jail. Dork Diaries: Tales from a Not-So-Fabulous Life by Rachel Renee Russell. It was so funny! It is realistic and easy to relate to. It’s one of the best books I ever read! There were a few repeats, which I left out. But that’s quite a variety! Readergirlz OPERATION TEEN BOOK DROP! I am so excited about Operation Teen Book Drop 09! Readergirlz just put up details about this years event. What exactly is Operation TBD? Operation Teen Book Drop is an amazing project that brings donations of thousands of fantastic YA titles to hospitalized teens all over the country. We are delighted to be teaming up with GuysLitWire and YALSA for the second Operation Teen Book Drop! In honor of Support Teen Literature Day, April 16th, 2009, readergirlz, GuysLitWire, YALSA, and publishers are working together to donate YA books to hospitalized teens across the country. Readergirlz is a teen online book community where members are challenged to read, reflect, and reach out. GuysLitWire is a top book-review source for literature appealing to teen guys. YALSA is the world leader in selecting books, videos, and audiobooks for teens. I think I want to get my classes involved in TBD this year. It would be a great follow-up to our Valentine’s Day Hope Chests. You should get involved, too!